White House Down. The White House is under attack again in this upcoming action starring Channing Tatum as a Capitol policeman on his day off with his daughter who must now work to protect the President (Jamie Foxx) from a surprise paramilitary threat. Also starring Maggie Gyllenhaal, this action thriller will open on a day much like any other on June 28, 2013. Arthur Newman. Colin Firth stars as a man who embarks on a journey of finding himself by faking his death and assuming a new identity. Along with a newly found companion on the same path (Emily Blunt), the name-swapping/ID-creating duo find that perhaps there was more to their past than they realized as the present/future look less fulfilling than at first. Look for this new start on April 26th. Hummingbird. Jason Statham stars as an ex-military special forces soldier who, while AWOL avoiding a court-martial, assumes another man’s identity and builds a life and seeks opportunity to right many wrongs in the process. An interesting tale both written and directed by Steven Knight (Eastern Promises) with a 2013 release. World War Z (trailer#2). Brad Pitt must fight to save the world in this upcoming book-to-film adaptation in which the planet has been infected by a Zombie epidemic and all of humanity is threatened. Pitt stars as a United Nation employee who travels across the world in search for a way to stop it, only, time is short. Will he be able to save his family along with the rest of humanity in time? Watch with the rest of the world on June 21, 2013. The Wolverine (int’l trailer). Here is the int’l trailer for Marvel’s The Wolverine. Directed by James Mangold, The Wolverine follows Logan in modern-day Japan where he meets up with an enemy from his past at a most vulnerable time and faces threat of a doomed and shortened future. This int’l trailer is far better than the domestic one that launched at the same time (You can watch that one HERE). Look for Hugh Jackman back in action against the Silver Samurai on July 26, 2013. Check out this trailer for the upcoming Civil War drama about a family torn apart by different stances on view of a war that tore the nation apart. 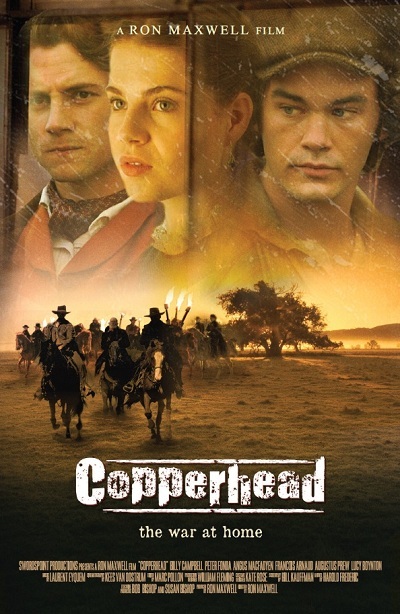 Directed by Ronald Maxwell (Gods & Generals and Gettysburg) and inspired by true events, Copperhead stars Peter Fonda, Billy Campbell, Angus Macfayden and more and releases on June 28. My favorite trailers from today: The Wolverine, White House Down, and Arthur Newman. Which ones are your favorites?? Limited Release: The Place Beyond the Pines, Room 237 and more. Ah, another quiet, pensive drama by Roland Emmerich ;-). Riddick and certainly Wolverine have my attention, too. Thanks, T.
I understand the worry with Riddick. Will it be like the wonderful first or the disappointing second film? Did you ever see the anime-like Dark Fury bridge piece? I think so. It helps ‘Chronicles’ some. But only some. I am heading over here soon to read them. I can’t wait. hahaha. I had to watch it several times myself. It’s crazy how much more is in the int’l trailer as opposed to the domestic one. ‘Arthur Newman’ looks interesting for the team up of Emily Blunt , Colin Firth and a Mercedes convertible. ‘Hummingbird’ looks intriguing. But for the love of God. Put Stratham in a shadowy 1960s Trench Coat noir set in the East End London docks fighting the Kray brothers and be done with it!!! The more hype and hoopla I seen thrown ‘Wolverine”s way. The more I prefer Marshall Ray Givens of ‘Justified’ (FX), Sheriff Hood of ‘Banshee’ and the boys of ‘Strike Back’ (Cinemax). ‘Copperhead’ looks and sounds like a re-worked, gritter, Luddite, ‘Gangs of New York’ take on Jimmy Stewart’s Civil War family epic, ‘Shenandoah’ from the 1960s. PS: Drop by FlixChatter when you have a few free minutes. My friend, thank you for stopping in and sharing your thoughts. I was surprised how I liked the idea of Arthur Newman myself. I’m curious (since you mentioned “Gangs of New York”) have you seen the plans for the tv series coming for Gangs of New York? I’m curious what your thoughts are. I read your post on Walter Mathau (thank you for the notification, btw. This week has been SO jam-packed I’ve been pressed for time to visit a lot of pages). I left a comment. I’ve been a fan of Emily Blunt since ‘The Devil Wears Prada’. She’s far more talented than Anne Hathaway and she hasn’t disappointed yet. I’d like to see her play a sometimes scary woman with a past. And predict she’ll quite well in ‘Arthur Newman’. ‘Copper’ already does that quite well. The Wolverine looks good! PLEEEASE let it actually be good, right? I skipped watching “White House Down” because I just watched the whole movie when it was called “Olympus Has Fallen” (Which is a better title, too, I might add) and I skipped watching the trailer for Hummingbird because if you’ve seen one Statham movie, you’ve seen them all, M I Right? I know what you mean about WWZ. Not ready to be excited for it yet. oh, White House Down. gotta love reruns! 🙂 but, when you DO see the trailer, let me know what you thought. The Wolverine actually looks halfway decent even though I’m not holding my breath after having disliked all of the X-men related films so far. Not to mention I’m tired of the superhero films. I’m also tired of studios finding no better ways to name a film than by giving them the name of their lead character. Did they not learn from John Carter? Besides that, Arthur Newman looks unique enough to peak my interest. I’ll certainly keep it in my radar. I’m also still a bit shocked that Brad Pitt is doing a film like World War Z. My hope is that his casting means the film will be somewhat good? I guess we’ll have to wait. Hi Niels! Great to see you. thank you for stopping in this week. I like The Wolverine trailer and am thankful it is far better than Wolverine Origins movie. can’t say that I feel the same about the titles of movies. sometimes it makes it worse trying to title it something different. I mean, I can’t imagine a different name for The Amazing Spider-Man or Iron Man or The Avengers, etc.